Founded in the fall of 1968, Mass Retirees has served as the lead advocates for all Massachusetts retired public employees for the past 50 years. From the Association’s humble beginnings, our mission has been to represent the interests of all public retirees at the state, local and federal levels of government. 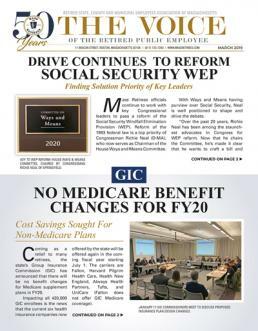 Our focus is public pension, Social Security, Medicare and retiree healthcare policy, for which Mass Retirees has become widely recognized for our expertise. JANUARY 3, 2019: The Massachusetts 2019-2020 Legislative Session officially began Tuesday, with the inauguration of the state’s 160 State Representatives and 40 Senators. Governor Charlie Baker and Lt. Governor Karyn Polito begin their 2nd term in office today. DECEMBER 5, 2018: This morning the state’s top budget, revenue and fiscal officials conducted what’s known at the Revenue Consensus Hearing. The annual State House meeting kicks off the coming budget debate for FY 2020. JULY 26, 2018: Governor Charlie Baker has rejected a Mass Retirees proposal that would increase the hourly limit for retirees returning to part-time public sector work. Our proposal, which was also backed by the Mass Police and Professional Fire Fighters, was passed within the FY19 State budget as outside section 29. The start of a New Year, ending in an even number, sets the stage for what will be a busy seven months on Beacon Hill. Under House and Senate rules, formal business within the State House ends on July 30th during the second year of the legislative session. We are pleased to share some exciting news: Boston Mayor Marty Walsh will be our special guest speaker at the Association’s Annual Meeting on Friday, September 8th at Lantana in Randolph. The meeting gets underway at 11:00 AM and all Mass Retirees members are invited join us in welcoming Mayor Walsh. August 15, 2017: Public pension plans are resilient, pose little burden on taxpayers, and stimulate the U.S.
APRIL 7, 2017: The news of Senator Ken Donnelly’s passing on April 2nd after an 8-month battle with brain cancer was met with great sadness on Beacon Hill, across the firefighter community and amongst our members. Donnelly, a retired Lt. from the Lexington Fire Dept. was not only a Mass Retirees member, but maintained a close friendship and collaboration with our Association dating back three decades.